Mumbai: Over 300 leaders from business, the start-up community, academia, research institutions and government came together at the Xynteo Exchange/India2022, hosted by TechnipFMC, in Mumbai. The day-long conference was attended by leaders from some of the largest businesses in India and Europe. The Exchange saw global leaders discuss a new leadership role that businesses can play in India’s growth story. In a free-flowing conversation, Mr. Harry Brekelmans, Projects and Technology Director and Member of the Executive Committee, Royal Dutch Shell Plc, and Osvald Bjelland, Chairman and CEO, Xynteo spoke about the need for deeper collaboration across industries. They urged the private sector to create new technologies and projects that can strengthen systems to bring about transformation in India. The India2022 Coalition is working on four impact tracks. The energise track, led by Shell and supported by TechnipFMC and GE; waste and sanitation led by Hindustan Unilever; healthcare led by Cyient; and sustainable mining led by Hindalco – Aditya Birla Group. The energise impact track is focused on energy access, bio-fuels, rural electrification, waste to energy and hybrid systems, aiming to develop and accelerate cleaner and efficient commercial solutions. Within the waste and sanitation track, the coalition is working towards realizing the lost value of plastic packaging: a 100 billion dollar a year opportunity globally. The healthcare track aims to advance medical diagnostics, which are disruptive and affordable, across all demographics. And the ambition for the sustainable mining track is to create a future ready business model and best-in-class sustainable practices. To further the work in these areas, four studios, hosted by the India2022 partners were convened at the Exchange. Those present worked together with experts, legislators and innovators to incubate ideas for commercial solutions that followed the India2022 impact track themes. 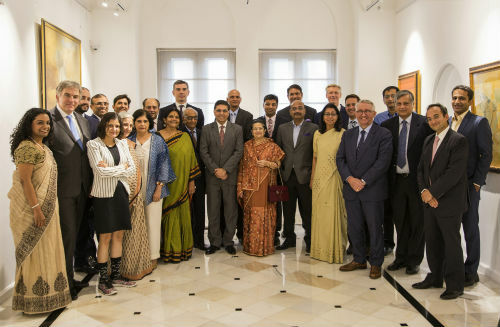 The Exchange closed with partners reinforcing their commitment to harness the power of collaboration and accelerate growth by the 75th year of India’s independence.